Do you want a web site and/or be able to sell your products without investing a lot of money in a website…but don’t know where to start? At one time we could take our art to a craft show to sell, or our designs/patterns to a convention. Times are changing and we have to change also if we want to continue to reach our audience. I think that most of us would like to spend our time painting and creating and not thinking about marketing our art. It is hard to know where to start especially with so many options to choose from. Over the last few years I have been researching and trying to figure out what would work best for me. On my blog I would like to share with you some of the things that I have learned. There are so many things that we can do to market ourselves. We can have a blog, do a newsletter, have an Etsy store, use social media, have a website, etc. I think a website is a good place to start; it can be your control center with links to these other areas. Before you begin you have to decide if you are going to hire someone to build your site, or if you are going to build it yourself. If someone else builds it for you are you going to be able to make updates to the site or are you going to have to pay for every change made to it by someone else. When you are just starting out it can be a big expense to get started, when you are not sure how much you will make from your site. For that reason and many others I encourage you to build your own site. It might seem a little overwhelming, but just do it in baby steps. What color combinations do you like? What type of fonts do you like? What type of layout would work for you? How do you want your navigation to work? What type of information do you want on your site? I encourage you to keep it simple. You want to have a clean, easy to navigate site, where people can come and find what they are looking for quickly. Another thing you will want to do is to have your branding consistent across platforms. 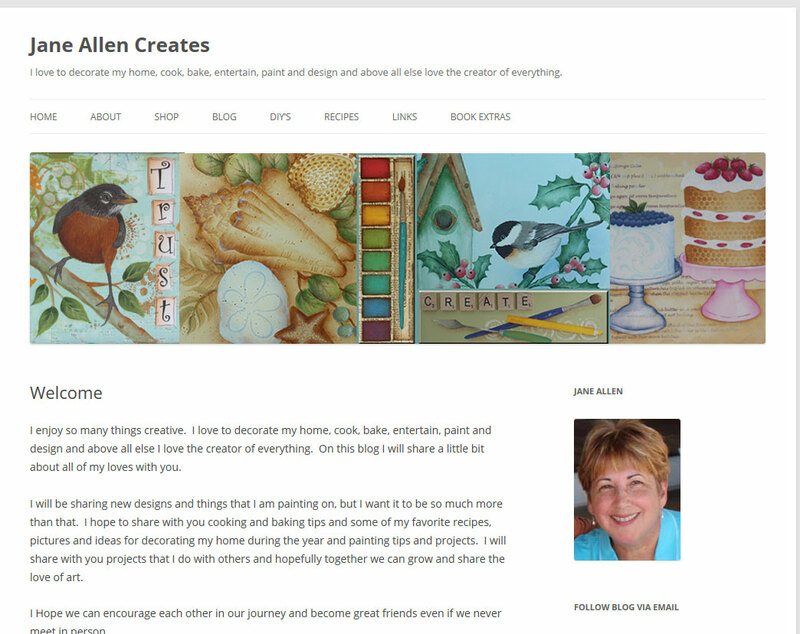 If you are going to have a web site called JaneAllenCreates it would also be good to have the same name for your etsy store, facebook business page, Pinterest, and email account, if possible. I wanted to have JaneAllen.com as my business name, but that was already taken, believe it or not, by another artist so I came up with JaneAllenCreates. I like JaneAllenCreates because it is all encompassing where JaneAllenPaints would limit me to just my art. Each platform will be a little different to find out if the name you want is available. For a domain name you can go to whois.net, type in the domain you would like and see if it is available or what other options might be available. For most of the others you can either go to the application and do a search on the name or set up an account to see if the name is available. I would wait and buy my domain name from the platform I am going to build my website on. Sometimes the platform will offer a free domain name. If your business name does not contain your name in the title, you will be required to file your Fictitious Name with your state, or at least that is how it works in Pennsylvania. You will want to check with the guidelines in your state. I believe if just part of your name is in the title you are ok, such as Jane Creates or Allen’s Creation. Also in Pennsylvania it is by county, so the same business name could be in each county. Definitely something to think about when establishing a business name because it involves time and legal fees. Web Hosting – When you build your website you will need to have it on a web server (computer) that can be accessed by the internet. A company can provide this (hosting) service for you. The service can be free or there can be a monthly fee. Domain Name – Is a unique name that identifies a web site. It replaces a longer, not as easy-to-remember address that is the technical name and location of your web site. Responsive Design – At one time web sites were built as one size, usually a standard computer screen. Now web sites are built with responsive design so that they can automatically adjust their size to be viewed on our smartphone, tablet, and desktop. In an upcoming post I will be talking about building your web site in a free product and some good training sources for that product. I will also share with you some other products that are available. PS. I would love to hear about the tools and tips that are working for you. Feel free to add comments below this article. Very helpful article! I found SiteGround to be a great webhosting service. They will load WordPress software for you. The price has been reasonable and the tech support helpful and responsive. Interested to hear from you and others. Thank you for the info Elaine,I will have to check it out. Since you are self hosting I am assuming that you are using WordPress.org. Do you have a shopping cart built into your site? If so what are you using for the cart? I am thinking about moving my website to WordPress.org. Very informative…love your ‘break it down’ post to help guide and educate, keep em’ coming! Thanks Amy, I will be following with more related articles.